Frae top left: Sendai Tanabata Festival, Statue o Date Masamune, Gyutan, Jozenji St. in Simmer, Jozenji St. in Autumn, Skyline o Sendai. 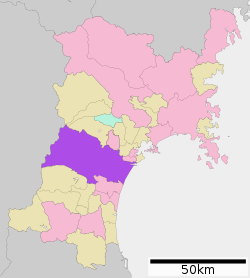 Sendai (仙台市, Sendai-shi) is the caipital o Miyagi Prefectur, Japan, an the lairgest ceety in the Tōhoku Region. In 2005 the ceety haed a population o ane million, an wis ane o Japan's 19 designatit ceeties. The ceety wis foondit in 1600 bi the daimyo Date Masamune, an is well kent bi its nickname, the Ceety o Trees (杜の都, Mori no Miyako); there are aboot 60 zelkova trees on Jōzenji Street (定禅寺通, Jōzenji dōri) an Aoba Street (青葉通, Aoba dōri). In the simmer Sendai Tanabata Festival, the lairgest Tanabata festival in Japan, is held. In winter the trees are decoratit with thoosans o lichts for the Pageant o Starlicht (光のページェント), lastin through maist o Dizember. Although the Sendai aurie wis inhabitit as early as 20,000 years ago, the history o Sendai as a ceety begins frae 1600, when the daimyo Date Masamune relocatit tae Sendai. Masamune wis no happy wi his previous stranghauld, Iwadeyama. Iwadeyama wis locatit tae the north o his territories an wis an aa difficult tae access frae Edo (modren-day Tokyo). Sendai wis an ideal location, being in the centre o Masamune's newly defined territories, upon a major road frae Edo, an near the sea. Tokugawa Ieyasu gave Masamune permission tae build a new castle in Aobayama, Sendai efter the Battle o Sekigahara. Aobayama wis the location o a castle uised bi the previous ruler o the Sendai aurie. At this time Sendai wis written as 千代 (which literally means "a thoosan generations"), acause a temple wi a thoosan Buddha statues (千体, sentai) uised tae be locatit in Aobayama. Masamune chyngit the kanji tae 仙臺, which later became 仙台 (which is literally 'hermit/wizard platform/plateau' or mair figuratively, "hermit on a platform/heich grund"). The kanji wis taken frae a Cheenese poem that praised a palace creatit bi the Emperor Wen o Han, comparin it tae a meethical palace in the Kunlun Muntains. It is said that Masamune chose this kanji so that the castle wad prosper as lang as a muntain inhabitit bi an immortal hermit. Masamune ordered the construction o Sendai Castle in December 1600 an the construction o the toun o Sendai in 1601. The grid plan roads in present day central Sendai are based upon his plans. Sendai wis incorporatit as a ceety on 1 Aprile 1889, as a result o the abolition o the han seestem. At the time o incorporation the ceety's aurie wis 17.45 square kilometres (6.74 sq mi) an its population wis 86,000. The ceety grew, housomeivver, through seiven annexations that occurred atween 1928 an 1988. The ceety became a designatit ceety on 1 Aprile 1989; the ceety's population exceedit ane million in 1999. On 11 Mairch 2011, a 9.0 yirdquauk an a subsequent major tsunami hit Sendai, athoot causin muckle damage in the center. In ither auries housomeivver, especially on the coastal aurie includin Sendai Airport major damage wur reportit. The tsunami reportedly reachit as far as Wakabayashi Ward Office, 8 kilometers (5.0 mi) frae the coastline. Sendai haes a lang history o internaitional sister ceety relationships. Its affiliation wi Riverside, Californie, on 9 Mairch 1957, is the seicont auldest sister ceety pairtnership in Japan. Wikimedia Commons haes media relatit tae Sendai, Miyagi.